If you see Three Friends and a Fork and we seem a little uppity...well, it is because we ARE uppity! We've been hanging out with a culinary rock star and we've got the big head! My sister's friend, Angie Moon ( I know...cool name!) mentioned on Facebook about going to the Bright Star in Bessemer to eat food prepared by the executive chef of Commander's Palace in New Orleans. What! Now you know we just couldn't let her do something so cool without the Three Friends getting in on the act! So, we got ourselves online and got our own reservations to the event. We even beat Angie Moon to the punch! We went on Friday night and she didn't go until Saturday. Thanks for the tip, Angie! The event is a collaboration of two historical restaurants. The Bright Star in Bessemer is Alabama's oldest restaurant. Since 1907, The Bright Star has delighted hungry folks from all over Alabama. The Commander's Palace in New Orleans is equally historic. It was established in 1880 and is owned by one of the premier restaurant families in New Orleans, the Brennans. The current executive chef of Commander's Palace, Tory McPhail is one of the bright and shining stars of the culinary world. He is the latest James Beard award winner and as the executive chef of Commander's Palace, he is in a long line of talented and successful culinary giants...Paul Prudhomme and Emeril Lagasse just to name two. For our Taste of New Orleans adventure, The Three Friends invited some more friends and we decided to make it a spend the night party. Our friends, Merri and Julie, and Merri's college friend, Susan, joined us for a fun night on the town. We left Scottsboro and arrived in Birmingham with a little bit of time to check into our hotel and freshen up before our 8:00 pm reservations. When we finally pulled up at The Bright Star, we noticed that the place was packed. Even with reservations, we had to wait for a while before being seated. At our table, our server presented us with the special menu for the night. It was divided into two parts....The Bright Star side which included Bright Star specialties and the Commander's Palace side which had the selections Chef Tory McPhail would be offering for the evening. I have to say, I was sorely tempted by the Greek snapper on the Bright Star side of things, but, since it is easier for me to get to Bright Star than it is for me to get to Commander's Palace, I opted to order from the Commander's Palace side of the menu. For appetizers we tried both the turtle soup and the oyster and absinthe stew. The turtle soup was rich and dark and delicious. The oyster and absinthe stew was creamy and light and absolutely wonderful. Everyone who ordered one of the soups was beyond pleased. This salad was sooooo good! Then came the salad and we all agreed the honey roasted peach and sugar cane salad was absolutely one of, if not, the best salads we have ever had. The Chilton County peaches were marinated in peach schnapps and some other liqueur, the name of which escapes me now, and then grilled. Wow! With the candied pecans, blue cheese and barbequed Vidalia onions piled on top of tender baby spinach and then drizzled with a spiced rum and sugarcane vinaigrette, well, it was pretty darn close to salad heaven! Our entrees included the pecan crusted Gulf grouper, sugarcane laquered Manchester Farms quail and The Bright Star's famous Greek-style beef tenderloin. The Bright Star is famous for that steak and they did not disappoint. It was so tender you could cut it with a fork and full of flavor. One of the best steaks I have ever had anywhere. The grouper was covered in spiced pecans and topped with sweet summer corn and Gulf blue crab. It was, of course, cooked perfectly...very delicious. But the entree that surprised us the most was the quail. Our server actually recommended it to us and she was right on the money. That quail was ah-mazing! The description of being laquered was absolutely accurate. The little birds were shellacked in a sweet and crunchy coating and then stuffed with andouille cornbread dressing. Then they were perched on top of bacon wilted Vidalia onions and summer cabbage. My gosh! Those little birds were so good! A mighty tasty little quail! For dessert, we shared Commander's Palace warm mixed berries topped with butter pecan ice cream. The berries were flambeed with orange peel, cinnamon, cloves, brandy and Grand Marnier. Those berries were divine! But the best part of our dinner? 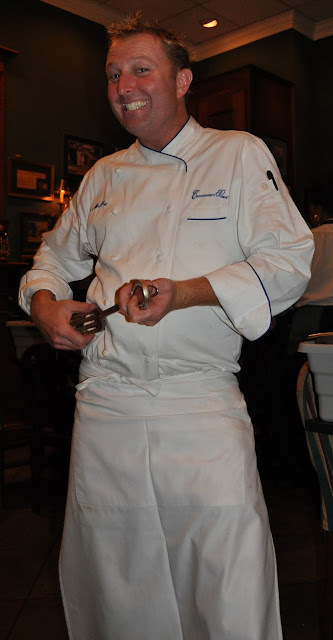 It was when Chef Tory McPhail...the James Beard award winner...came to our table, played OUR fork like an air guitar and SAT down at our table! Oh, yeah! And, not only did Chef McPhail stop by the table to meet us, but Jimmy Koikos, owner of The Bright Star, also came by to check out our fork. We've hit the big time and will be signing autographs! Lu explains the famous fork to Bright Star owner, Jimmy Koikos. Mr. Jimmy takes the fork! Sherri gets in on the action. growing up in Washington state where his family owns a huge berry farm. He said when we buy raspberries at the store, they likely come from his family's farm. He invited us to come visit him in New Orleans at Commander's Palace. We are so taking him up on that offer and, Chef McPhail....we will be bringing our fork! We've got our fork and we're ready to eat! Oh, look! There's that cute Chef McPhail at our table and with our FORK! Three Friends and a Fork and our friends, Merri, Julie and Susan give The Bright Star restaurant and Commander's Palace and Chef Tory McPhail 3 HUGE Yums UP!